Click here for the Pokemon Rumble U Password list. Exhilarating battles unfold with countless Pokémon on your Wii U! 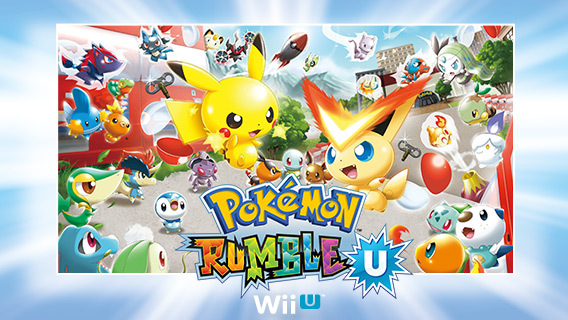 In Pokémon Rumble U, you’ll be able to experience amazingly vivid battles packed with many Pokémon on the Wii U. You may find yourself in a battle with up to 100 Pokémon at a time! Battle your way through the enemies surrounding you and experience an epic adventure! All 649 Pokémon are available to collect! Pokémon Rumble U will feature all of the 649 Pokémon that have been discovered. This includes every Pokémon since the original Pokémon Red and Pokémon Blue through the latest games in the series, Pokémon Black 2 and Pokémon White 2! Every Pokémon fan will be able to choose his or her favorite Pokémon of all to play with! There are hundreds of moves to use as well! It’s amazing how much there is to see and do in Pokémon Rumble U! Get more Pokémon on your side! In Pokémon Rumble U, the more Toy Pokémon that you defeat, the more Toy Pokémon you could have on your side. When you find a Toy Pokémon that you like, you may be able to bring it over to your side and use it in your next battle! One of your goals will be to befriend more and more Toy Pokémon and try to get all 649 on your side. When you defeat a Pokémon, a Capsule may appear. Approach the Capsule and you’ll get a new friend for yourself! When you get a Capsule, the Pokémon you defeated will join your team! Keep beating more and more Pokémon to gather your allies! Enjoy multi-player battles with friends! You can enjoy multiplayer battles with up to four players in Pokémon Rumble U. Work together with friends or family to take on the most powerful enemies, or compete to see who can defeat the most Toy Pokémon in one go. Multiplayer battles are a great way to enjoy the game!